Jimbo's Front Porch: FIRST WOOD CARVING CLASS! 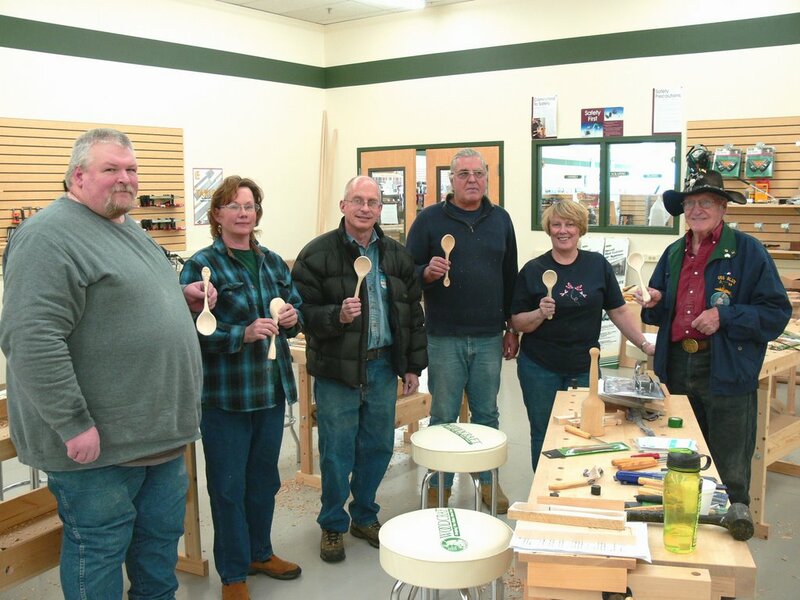 These nice people were my first ever class for beginning wood carving at Woodcraft, where i work part time. What a great bunch! Except that i was teaching them how to carve crochet hooks and they messed up a little bit and, well you see the results. Just kidding. 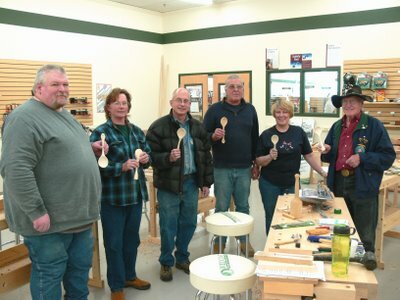 These kind and patient people sat through a lecture on safety, tools, sharpening, etc; then did some exercises in technique, and finally ended up carving a spoon. And what a great job they did! Wonderful folks and, although several were too humble, i think they all exhibit some pretty decent talent, wouldn't you say? The wood spoons look great. I would say your class was successful! You must be a good teacher, they did a great job on their spoons!!! Funny lookin' hooks! LOL Seriously, do they realize that their teacher is a celebrity? Thanks Wendy! Actually it was pretty tiring even though i used bass wood for the spoons. Carving when you aren't used to it is a bit arduous. But they were troopers and i thought they all did great! The guy on the left side also carved a face on the end of his handle. Very nice work. I was pleased and relieved that it went so well. Chris, i'd love to see the fork and spoon your Great Grandfather made. Its really interesting seeing what those folks could do without all the modern conveniences. Sandpaper for example. I don't think sandpaper, at least in the form we know it, was available back then. Wonder how they got things done. And no they didn't realize they were in the company of Jimbo the hookmaker. ha like that would have been impressive eh? Hey, teach, them's cool looking hooks...I mean spoons!